Ever heard of Mount Afadjato? It happens to be the highest mountain in Ghana at 2,904ft. The 855 meter high mountain is located in the Agumatsa range near the villages of Liati. Afadjato is covered with tropical forests and has different types of flora. It is home to over 300 species of butterflies and 33 species of mammals so... you can add some bunch of banana to your napsac. 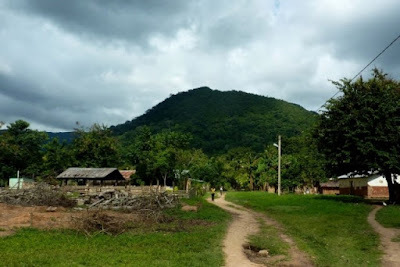 A tourist needs to stop at the tourism office in the village before embarking on an adventure to this great mountain. A token is being paid as entry fee and a tour guide appointed to walk you all the way through the forest till you get to the mountain and back. Dhamey along side his friends took a road trip to this impeccable mountain. They left Kumasi early in the morning to experience the climbing of the most talked about mountain in Ghana. According to him, it was an herculean task climbing the mountain and at some point he wished he had supernatural powers to aid him in his conquest. While climbing, so many questions went through his mind like "what the heck am i doing?! who sent me?! what am i looking for?!"...LOL. The mountain top was seen after about an hour of walk. Not everyone who climbs mountain afadjato conquers it so he felt really on top of the world when he did. It was indeed an achievement for him and his friends. When visiting mountain afadjato, you could go with a permanent marker to record your visit on any rock of your choice. It can be very rocky but if you are adventurous it is worth a try. Make sure you wear your most comfortable pair of shoes although some people walked it bare footed. You can get to visit Tagbo water falls if you are not tired after the walk. The magnificent scenery of the villages, towns, deep valleys, volta lakes from the mountain top will leave you spellbound. Thanks dhammy for sharing your exciting experience. Mount afadjato definitely joins my to go list. Thank u both (Dhammy & the blogger) for sharing this great African holiday experience with us. You are promoting African tourism and God will bless u for the local content promotion. When we r thinking of holiday Omg we hardly think about going to places in Africa , partly cause of poor packaging, poor marketing, lack of awareness or just cos of our appetite for "oyinbo thingz". This is just d beginning. Let do Africa let's do Naija !